People often ask the difference between an introductory program and the Immersion. An intro is a “taste,” providing foundational tools and concepts and brief coaching. Gail has taught intro classes at Omega Institute for ten years and in 2019 is offering an expanded version Transformational Speaking Foundation August 9-10 in Victoria, British Columbia. This class represents 15 hours of class time with 20 people. The four-day Transformational Speaking Immersion, for only six participants, is a 33+-hour program that includes on-camera personal coaching with Gail as you progressively build self-trust and speaking skills while discovering and developing your best material and stories. It is an unforgettable journey into the heart of who you are and what you are here to say, culminating in your design and delivery of a wildly new presentation that speaks powerfully to what you love. 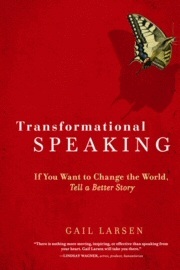 Because enrollment in the Transformational Speaking Immersion is limited to six participants, please Gail: gail [at] realspeaking.com (and CC: support [at] realspeaking.com as Gail is often off email during her travels) to check availability in the program of your choice and download your application here. The program begins at 10 a.m on the opening day and concludes by 4:00 p.m. on the closing day. Our usual format is to begin on Thursday morning and complete on Sunday afternoon unless otherwise noted. October 4-5, 2019 Tucson, AZ Expand and Express! A new collaboration with Tryshe Dhevney and Pam Hale for a circle of just 12 women. Here you’ll strengthen and expand your inner foundation to express yourself more fully and authentically in the outer world. TBD after we complete our first San Miguel program in June. Plans are in process for an intro class at the gorgeous Art of Living Retreat Center in The Blue Ridge Mountains in North Carolina (fly into Charlotte). Please let us know if you want to be on an early notification list when plans are firm! 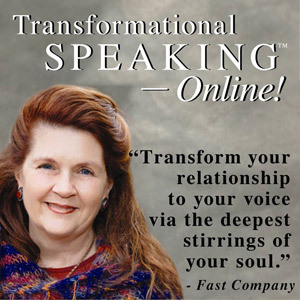 If you’re eager to get started, consider joining us online where the heart and soul of the 4-day Transformational Speaking Immersions is now an elegant virtual academy. And, yes! It is still a spirited and substantive adventure with deep inquiry, training audios, and video discussions with transformational speakers who have applied the course principles, as well as speakers in action. 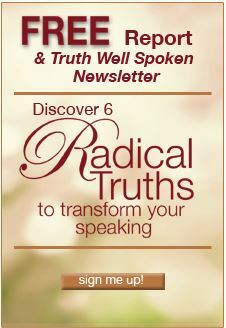 It is designed to support your journey to finding and trusting your way to speak and bring forth your true voice and message. *With classes booked months in advance, clients sometimes find it necessary to reschedule and we go directly to the wait list. If you have your heart set on the Immersion and the date you want to come is fully enrolled, please complete your application as noted above and email gail @ real speaking . com (CC: support@realspeaking.com as Gail is often off email during her travels) to wait list for an upcoming class or to be notified as additional classes are scheduled. Thank you! It is an honor to have our classes enrolled so far in advance, and we are exploring ways to increase our capacity. One way is with our virtual academy, Transformational Speaking—Online! Please consider it an option to the live training, especially if you are currently exploring your direction and message. It contains all the teachings and processes of the Immersion with regularly scheduled community calls with Gail for Q&A, accountability, and group coaching. Start anytime!